When to Start Paleo Diet? If you put food in his mouth does he keep it in or push it out? If he pushes it out it is called the ‘tongue thrust reflex’ and that is your baby’s way of telling you he is not ready for food yet. Can your baby sit up unattended? Does your baby show interest in what you are eating? Is he mimicking you when you are eating or trying to grab the food from your plate? It is important to be careful with your little one’s tummy. For most babies, their digestive system has not developed enough for the introduction of food until they are around 6 months old. If you introduce too much food or food too soon, you can set them up for digestive issues later on. First and foremost, the introduction of food should be fun! This is a time of exploration and bonding with your baby. The more you are having fun with it the more your baby will have fun too. Talk to them, explaining what you are doing and what they are eating. Remember, the transition to solid foods as your baby’s main source of food and nutrients is a long process. In the beginning your feedings will look more like a tasting than a feast. So, relax and have fun! When you begin to introduce food make sure it is organic and homemade. 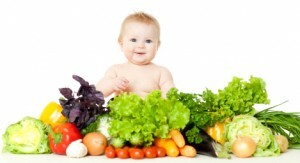 It is important that the food introduced be organic because your baby’s body is small and new. The introduction of chemicals and pesticides to their bodies is significantly more harmful to them and sets them up for a lifetime of health issues. We recommend homemade food because commercial food has been cooked to a point that it has lost most of its nutrients. It also introduces preservatives to your little one’s system. Plus, it is old food and is significantly more expensive than if you make it yourself! All of this is even more important if your baby is already showing signs of Autism Spectrum Disorder (ASD), or is struggling with allergies. Research has proven that enriched foods (which are all baby foods bought at the store) act as a toxin for children struggling with ASD and can be a trigger for an allergic reaction in those who are sensitive. When introducing food, choose a time of day that is not a normal feeding time for your baby, and not when he or she is tired. Choose one food to introduce at a time. The first time you introduce each new food only feed your baby 1 teaspoon. Add breast milk or formula so your baby tastes something familiar in the food. Make it the consistency of thick milk. Making your baby food is quick and easy. It is just important to remember to be safe. Make sure to wash your hands and equipment before beginning. Wash your fruits and vegetables thoroughly. Make sure all meat is fully cooked. Always throw away any uneaten food in the baby’s bowl when finished feeding. Never allow food to sit at room temperature for more than 2 hours. Baby food should be properly labeled and stored in the freezer for no more than a month. De-thawed food can be stored in the refrigerator for no more than two to three days. Never serve your baby hot food. Make sure the food is room temperature or just slightly warmer. My husband and I both have food allergies so when I started my little Jedi on food I knew I was going to have to be smart. Here are a few things I did that worked. I bought a small whiteboard and put it on my fridge. Every time I introduced a new food I would write the date and what it was I fed him. If any reactions occurred I could look and see what might have been the culprit. I would wait at least 6 days between introducing new foods. As soon as I had a few foods I knew he was ok with, I began to rotate them so he was not getting the same thing every day. If you try all the usual tricks and are still having problems, please email us. We would love to help you and your little one! Introducing Food – Let’s get this party started! At this stage, especially in the beginning, you are getting your little one used to a spoon more than anything. Some 4-month-old babies will want nothing to do with food for the first ten attempts. Others will begin to eat everything you have in the bowl and ask for more at the first feeding. Listen to your baby’s cues and you will know what he or she needs. It is also important to remember that at this age solid foods do not replace your baby’s nursing or formula feedings. Here is what is generally recommended, but remember every baby is different. So, be prepared to feed more or less depending on your baby. Make sure to buy organic and, if possible, free range eggs. They will contain the most nutrients for your baby’s body and brain. There are two different ways to serve egg yolk to your little one. To Cook: Cook until whites are firm but yolk is still runny. To Serve: Cut a slit in the yolk and scoop it out into a separate bowl. Sprinkle a pinch of high quality salt on top and serve. To Cook: Place egg in pot filled with cold water. Bring water to a boil and cover the pan. Immediately turn off the stove and remove from burner. Let the egg sit covered for 12 minutes. Submerge the egg in cold water. Tap the egg on the counter and then roll it around to make it easier to peel. To Serve: Remove the egg whites. Mash the yolk in a bowl. Add breast milk or formula and mix until it is the right consistency. Sprinkle with salt and serve. Tips & tricks: Cook up additional eggs for yourself and add the leftover egg whites so none go to waste. Then you and your baby can enjoy a meal together. Make sure you get the bones from the butcher at your local health food store or from another reputable source like www.uswellnessmeats.com. Apple Cider Vinegar. Bring water to a simmer then keep on low heat for 12-24 hours. Pour broth through a fine mesh strainer then refrigerate or freeze. To Serve: Bring broth to room temperature by heating it up on the stove. Sprinkle with salt and serve. You can also puree the marrow and serve to your baby. It is extremely high in nutrients. Tips & tricks: Freeze one ice cube trays worth of broth for your baby and use the rest to make a soup or stew for the family. Visit our website for recipe ideas. Make sure you choose organic ripe bananas. To cook: There is no need to cook the banana. It should be raw when served to your baby. To serve: Simply mash banana till it is smooth. If your baby needs it a bit more runny simply add a teaspoon at a time of breast milk or formula until it is the right consistency. 6-8 Months: Now for some real fun! At this age, your baby may seem like a pro at eating or may just be beginning to explore solid foods. Whatever the case is, remember it may take a while for your little one to like certain tastes, so be patient. Keep introducing different foods and have fun! At this age, your baby should still be receiving plenty of formula or nursing sessions. Also, you can and should start offering them water. Start with 2-3 ounces at a time. It is easy for food to go to waste at this stage. To save you time and money make up a larger batch of the foods you know your baby loves. Scoop it into ice cube trays and freeze. Then, you can pull out a serving at a time. Plus, if you will be gone all day you can throw the cubes in a bag and it will be ready by lunch or dinner but won’t have a chance to go bad. Organic turkey, chicken, and organic grass fed beef are great choices! Meat will give your baby the iron, zinc and protein he needs. To Cook: Add 1 cup cold and cooked meat to your food processor or blender. Puree until powdery. Slowly add in broth (best if homemade) or water till it is the right consistency for your baby. You’ll usually add no more than ¼ cup liquid. To Serve: You can serve cold or heat up on the stove till it is room temperature. Great fruits at this age are avocado, melon, applesauce, mango and papaya. Serve one at a time so baby has an easy time digesting and is not overloaded with sugar. To Cook: Great news, these fruits do not need to be cooked! To Serve: Simply mash fruit until it is smooth. If your baby needs it a bit more runny add a teaspoon at a time of breast milk or formula for the right consistency. The best vegetables to start with are squash, beets, carrots, yams, sweet potatoes, and green beans. At this stage of introduction I recommend only feeding your baby one vegetable at a time. If your little one seems to have no reactions and seems to be digesting well, you can start mixing different vegetables together for different flavors. To Cook: The best way to cook these vegetables is to steam them. Once they are soft, mash them or puree in a blender or food processor until they are the desired consistency. Mix with broth, grass fed butter, or coconut oil to increase the nutritional content of their food and to help their digestion of these foods. To Serve: You can serve cold or heat up on the stove until it is room temperature. This is a great age to try introducing dairy if you are not following a strict paleo diet. Use either organic grass fed plain cow yogurt or organic plain goat yogurt. For babies who show signs of allergies, goat products tend to be a better option. If your baby is showing signs of ASD, it is best to keep him or her off dairy entirely due to the casein present in both types of dairy. To Serve: Start with 2 Teaspoons Organic plain cow’s or goat’s yogurt or kefir. Now things begin to get real fun! Most likely, your baby is letting you know that he or she wants to taste everything you are having! Welcome to family meals. What is great is that most babies are ready to eat anything and everything you will give them at this point. There are some babies that still want very little to do with food at this age and that is ok too. Every baby is different. As long as there are no developmental issues, just give your baby time and he will come around to food eventually. Your baby is now ready for fruits higher in pectin such as blueberries, peaches, pears and apples. I recommend still cooking these fruits. Lightly steam or stew them to break down some of the pectin and to help your baby digest them. When first introducing them try just one fruit at a time, but if your baby has no reaction mix them for more fun! Single Fruit – Peaches, Pears, Nectarines, etc. To Cook: To bake, cut the fruit in half. Remove seed and place fruit open side down in a baking dish with 1 inch of water. Bake at 400 degrees until soft and tender. Reserve the liquid in dish for puréeing. Allow the fruit to cool. Remove the skin. Place the fruit in your blender or food processor and blend. Add in the reserved liquid until it is the desired consistency. To Cook: Place ½ cup of water in a pan and bring to a boil. Place ½ Pint of fresh or frozen blueberries in the boiling water and simmer for 15 minutes until soft. Place the fruit in your blender or food processor and blend. Add in the reserved liquid until it is the desired consistency. Cooked fruit makes a great beginner finger food! Simply cut the fruit into small pieces after cooking. Allow it to cool and place some pieces on your baby’s tray. Ripe bananas and ripe avocados are even easier. Simply dice and serve. Your baby will love it. Mix ½ cup papaya puree, ¼ cup mashed banana & ½ cup plain yogurt. Mix in a bowl or blend in your food processor or blender. Mix ½ cup applesauce and ¼ cup cooked blueberries. You can also try adding other fruits such as mango or plum as well. Pour ¼ cup of kefir in a bowl or cup. Slowly stir, “swirl”, in ¼ cup peach puree. You can also add in small chunks of banana for a fun texture change. Mash ½ avocado until completely smooth. Stir in small chunks of very soft mango. Stir in a little water, 1 teaspoon at a time, until it is the right consistency. Cook your pear with whatever method you choose. Then, instead of blending it, cut it into small pieces. Place ¼ cup cut pear into a bowl. Pour ½ cup yogurt into bowl and stir. You can also make this with apple instead of pear. Try sprinkling some cinnamon on top for a different flavor. A great way to get your baby to eat vegetables now and as he or she gets older is to mix them with other foods so they are more appealing. Steam or sauté ½ cup diced apple and ½ cup diced carrot. Blend in your food processor or blender. To make it a little more fun add in 1 teaspoon ginger. Mix ½ cup mashed sweet potato with ½ cup cooked applesauce and ¼ cooked and pureed greens. I prefer chard, but you can also try spinach or kale. Mix ½ cup mashed sweet potato with ½ cup mashed banana. Add in 1 teaspoon vanilla flavoring (make sure it is organic and free of fillers like soy), and 1 teaspoon cinnamon. Steam or sauté ¼ cup green beans and ¼ cup greens. Blend in your food processor or blender. Stir this mixture in with 1 mashed avocado. To add a little sweetness and a texture variant you can also mix in 1/8 cup diced steamed carrots or apple. Mix ½ cup mashed sweet potato and ½ cup cooked peach (either mashed or diced). Add in a little water or leftover cooking juice from baking your peaches if needed. You can also do some more complex fruit and vegetable mixes. Just be sure to start slowly so you can note if your baby is having any digestion issues or adverse reactions. It is also fun to add in yogurt or kefir to these mixes. Steamed and diced vegetables are a great first finger food as well. Diced sweet potato or peas and carrots are some of our favorites to start with. Choose some of your favorite garden vegetables. Try green beans, summer squash, greens and carrots. Simmer 1 cup vegetables of your choice in 2 cups broth (preferably homemade). For additional flavor add in a pinch of salt and1 teaspoon each thyme, parsley, and garlic. Once the vegetables are soft simply mash them or pour everything in the blender and puree depending on your baby’s texture preference. I love this soup, because it is so easy and is a great food to share together. Simply place ½ cooked apple, ½ cooked carrot, 2 cups cooked butternut squash, and 2 cups broth in the blender. Puree until smooth. Pour into pot. Mix in ¼ teaspoon salt, cinnamon and nutmeg and slowly heat on stove until it is room temperature or a little warmer. If your baby enjoys texture or to add protein, simply stir in cooked ground turkey or lamb. Finely dice carrot, celery, and peas. Simmer until soft in broth with garlic and parsley. Add in finely diced cooked chicken. Heat to the desired temperature. It is never too early to start eating meals as a family. It is also never too early to move away from being what sometimes feels like a short order cook. To make meat dinners all you need to do is simply puree or mash together a small portion of appropriate meat and vegetables from the dinner you are preparing for yourself. Beef, lamb, turkey or chicken are all great choices. Just make sure your meat is organic and made small enough to not be a chocking hazard or hard to digest. Also, do not mix fruits and protein. This is extremely difficult on your baby’s digestion. Along with yogurt and kefir you can now add cheese to the list of foods for your little one. Make sure it is organic and raw. Try cutting the cheese into very small cubes for a fun finger food. You can also add some shredded cheese in with your veggies while you heat them. Just be sure to continue to watch your baby for allergic reactions or other adverse effects. By one, your baby has now been introduced to a wonderful world of tastes and textures. Hopefully you both have enjoyed the journey! Your baby is now ready to begin to eat more food both in variety and quantity. When you introduce food to your baby, if he or she shows signs of allergies, digestion issues or any other difficulty with eating we would love to help! We know how hard it is to have a baby with a rash or tummy troubles. A lot of issues, if caught early and helped properly, can be resolved quickly. Let Swanson Health Center help you make your journey into toddler hood a fun and enjoyable one!